Eight runners three to four years of age. Decent prize money. Just four horses with race experience and an equal number of debutantes from the good, bad and ugly of trainers. I won't point the finger - that would be rude. Regular readers will know which horse I am going to detail first. Basheer. 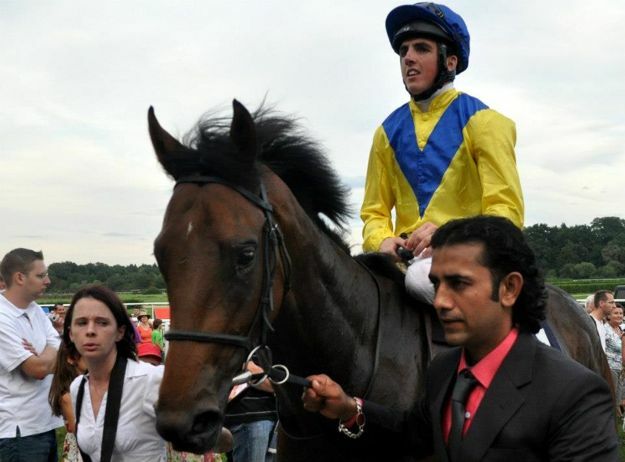 I must admit my hair has thinned quite dramatically since mentioning this son of Dubawi. I've been pulling it out in tufts, betting slips screwed up in balls & crying into my pillow. Dreams where I try to run away but slow as a tortoise. It hasn't been quite that bad. However, Marco Botti did send me a tweet saying his black thatch was, in fact, a costly syrup of figs. The trials and tribulations of betting on talking horses. Yes, I know he is three now! He was seriously backed on debut at Wolverhampton but suffered a slow start from a wide draw, pulled hard, looked to hold some hope before tiring quickly to finish second from last. Luckily for our supporters, I suggested a straight bet on Basheer & Karl Burke's Fear The Fury who won well. Clearly, Marco Botti and the Italian job had been singing the praises of this bay colt (me too) thinking with a bit of spit and polish he would shine at Kempton racecourse. Yikes...(I should have known what was coming). He was well backed from double-figure odds. This looked promising. I detailed an each-way bet. The shekels were down. Watching the race, Basheer was a touch awkward from the starts, much too keen, but turning the bend looked to hold every chance. I wasn't concerned about my hair, the bet looked to hold some value, and life was good. He started to tire in the closing stages as Dark Destroyer ran off, while Tricorn and Rock N Roll Global chased after Basheer as though someone had bet two wigs to one that a flash of lightning would remarkably turn a walnut to ash. Balder F****** Dash - he finished fourth, being nabbed for third place by half a length. Here we are again. Basheer. Me, Marco Botti, even the lad looks a little light on top. Conclusion: A post dedicated to one horse. Desperate. I guess the question boils dow to this. Have we lost the faith? No. Clearly, Basheer has (had) a reputation as a decent prospect. The first start was the classic debutante fail. These things happen. As I say, sometimes the worse a horse looks on debut, the better it turns out to be. It says something after being beaten sixteen lengths on his racecourse bow that he was backed to 3-1 co-second favourite at Kempton. Things didn't go to plan. His youthful exuberance cost him (you, me...them) dear as he tired in the closing half furlong. Botti is dropping this March foal back to 6f, probably fearing the horse may struggle to last seven if keen. The hood remains, which, hopefully, will help him settle. This lesser trip will help take the edge off stamina and it shouldn't be a problem. We may even have the opposite problem of being slightly outpaced. Botti is taking a measured response to recent problems. This race features decent prize money so connections will be very happy if today Basheer can taste victory. It's a pity Basheer isn't an each-way price. I may well hold out and hope one or two are supported because if we can steal 7/2, 4/1...5/1 (unlikely) I'd be taking this as a good bet. I wouldn't knock anyone going for the straight win but I'm a cautious soul.To me, this looks an ideal horse to have in an each-way double. With only eight runners, it may pay to see if there are any non-runners before getting stuck in.